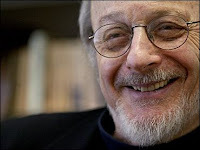 E. L. Doctorow was here visiting in March of 2005, and I moderated a discussion with him for about an hour one Tuesday morning late that month. Now I’ve edited a twenty-minute excerpt of that longer interview — as the twentieth episode in the Kelly Writers House podcast series. You can subscribe to these through iTunes and you can download the Doctorow podcast now just by clicking here.